Choose a classic luxury look with this beautiful bridal ring, crafted in 18k white gold plated and glittering cubic zirconia. 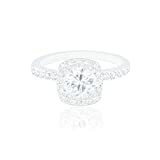 The engagement ring highlights a stunning 1.90 carats cz round, mounted high centerpiece framed in halo of dazzling smaller stones in a eight-prong setting cushion beauty marks, and framed by channel-set round-cut side stones. 18k white gold overlay gives these rings a radiant finish that’s non-tarnishing and hypoallergenic. ORROUS & CO offers a full 3-Year warranty covering manufacturing and material defects for genuine branded ORROUS & CO Fine Jewelry. We GUARANTEE complete satisfaction on your ORROUS & CO Legacy Collection Fine Jewelry purchase. Please contact us via email if you have any questions.